It's funny how under certain circumstances you can feel like an "expert", or at least "experienced" and then under other circumstances, with the same subject, you now feel like a "new-comer". Such is the RV life! 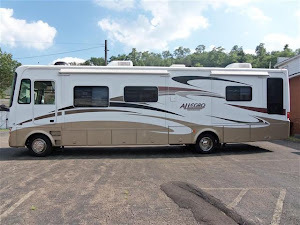 We have been full-timing it for 18 months now, and compared to some of the folks we've met at campgrounds along the way, we are "rare and experienced" and are asked a lot of questions. Then you come to a situation like we did this week...a "Rally", changes everything. 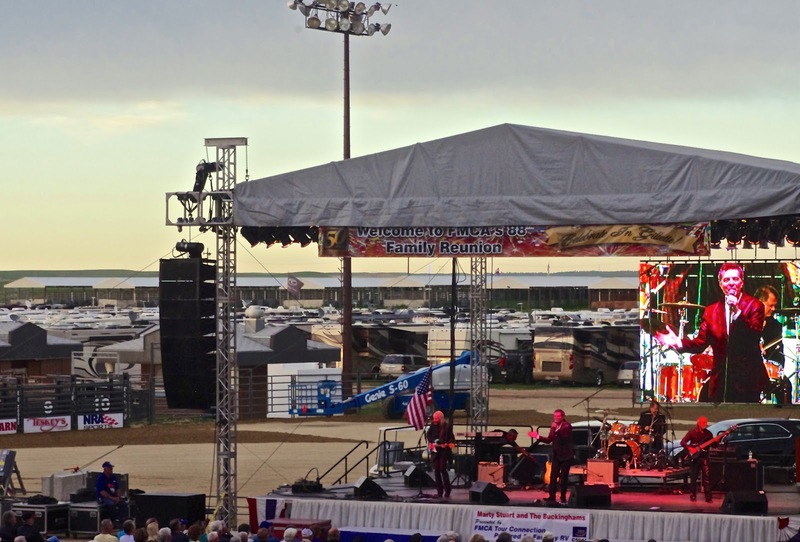 The Family Motor Coach Association celebrated their 50th anniversary with a big rally and reunion in Gillette Wyoming. 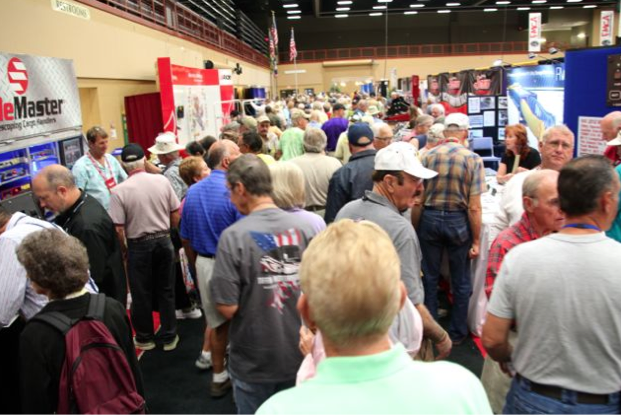 2639 motor coaches and around 6000 people attended a four day celebration filled with seminars, shopping, exhibits, historic motor coaches, new ones to tempt you, entertainment and fun. 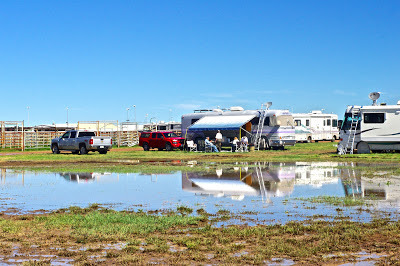 The few days leading up to the rally found us in campgrounds in Cody and Buffalo on our way to Gillette - along with dozens of other fellow FMCA rally bound campers. On one such night we had an opportunity to visit with several of them over an ice cream social given by one of the campground hosts. We quickly learned how "new" we were at this life style! 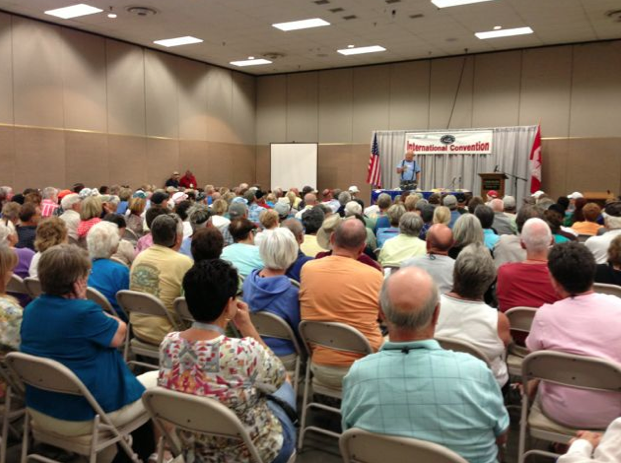 We might be the rare "full-timer" but other folks have been RVing (and going to these rallies) for 10, 15, 20 years. "New-comer" took on a whole new meaning! The day of the check-in found us leaving our campground in Buffalo at the same time as many others - all headed where we were. 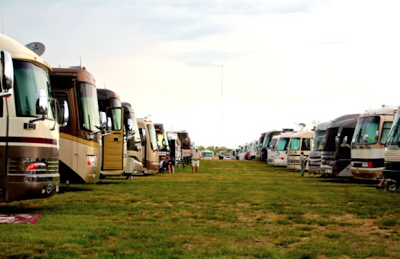 What a strange sight to be on an Interstate with nothing but RVs all heading to the same place. The only other rally we have attended was the small one put on by the manufacturer of our rig. That was in Florida last year, and we didn't see anyone on the road with us as we traveled to it! 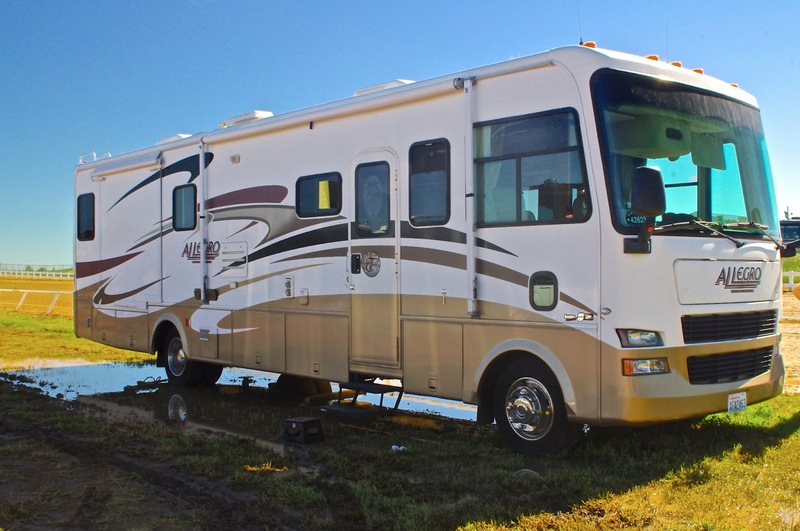 For those of you not familiar with rallies (we sure weren't before we joined the RV world). They are an organized gathering of like-interested (or like-coach) folks to come together for a few days to camp, socialize and learn. Depending on who is hosting and how large the group is, vendors, RV dealers along with their latest rigs and entertainment, might be included. Something like this, that draws people from all over the US and Canada, it's as big as a State Fair, with seminars going on throughout each day on just about every subject having to do with this life-style from maintaining your rig to cooking in it! 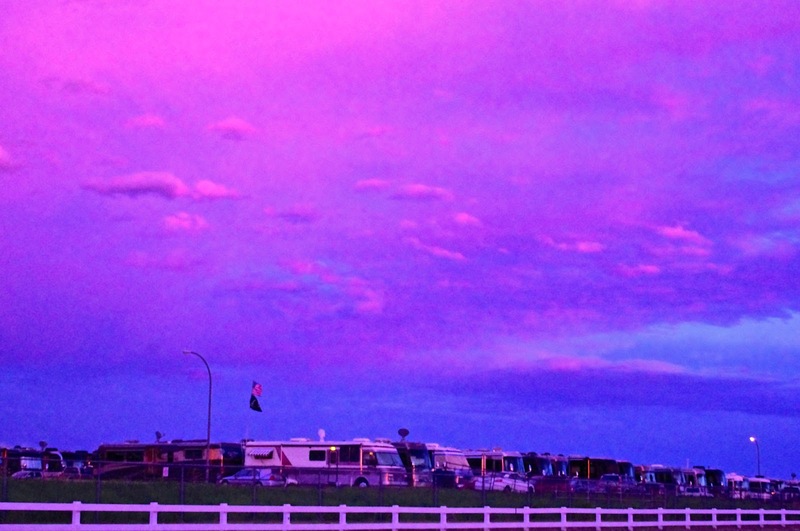 Here in Wyoming, each day brought on a different kind of weather too. 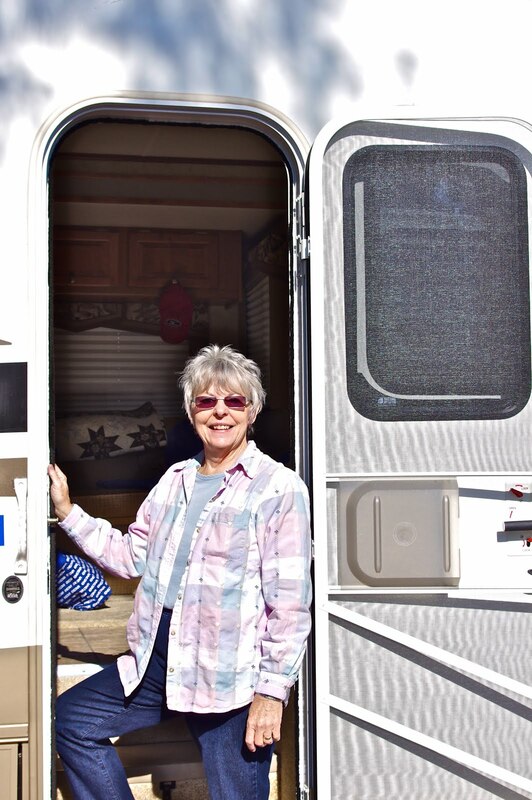 The day of check-in was thankfully, sunny, as hundreds upon hundreds of coaches arrived and were guided in by experienced and well staffed volunteers. 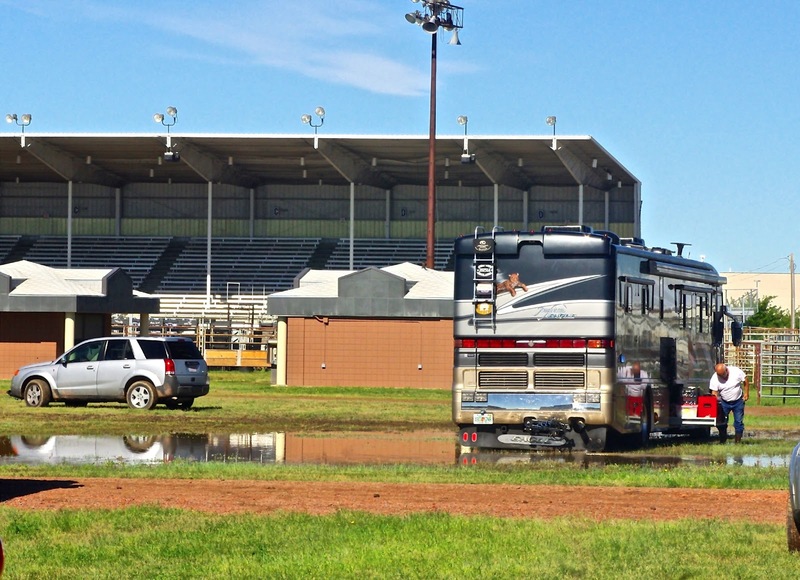 The Cam-Plex that this was being held at was a huge dirt & grass multi-event arena. They had us parking in row after row, after row, around and around we went to what seemed like miles of coaches! That night gave us a beautiful sunset to start our celebration off. However, it was soon to change! The sun quickly left us and the storm of wind and rain came in with full force adding a show of lightening and thunder to the next night. Our rigs were rocking and rolling. 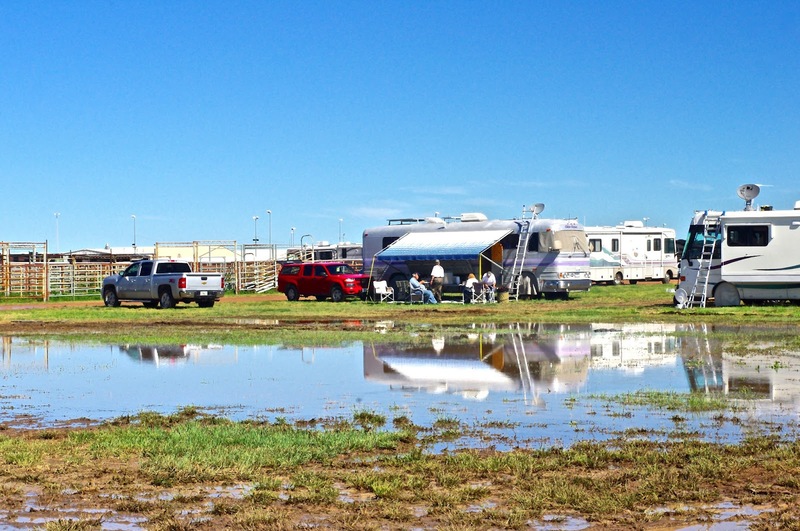 As we started out the following day, to mud and grass soaked fields, we didn't let it slow us down. 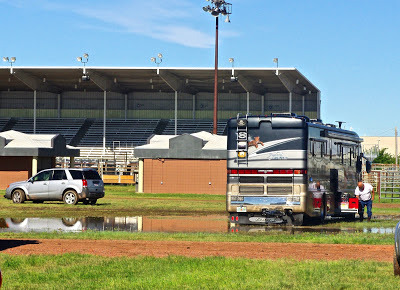 The rally organizers had school buses that ran shuttles all day and evening until everything was over so that we could easily get to and from the various areas with the least bit of trouble. Good thing, because as the days continued, so did the weather worsen. Day 3 brought more rain and then a heavy down poor of hail! Inches of it! We even got a tornado warning for a few hours! Some of us were left stranded in the exhibit hall with the vendors and just had to go on shopping (me!). They brought in some fun entertainment for us as well. One night they sent us down memory lane with The Buckinghams as they sang songs from the 1960's with many of us singing right along with them! Friday evening they held a "Black Tie and Blue Jeans Dance" that we were just to tired to go to! Dashing from seminar to seminar from 8am to 4pm every day just tuckered us out! We haven't had to cram so much learning in, in a long time! Just ask me how to clean a holding tank now, and I can tell you! We made up for it Saturday tho and got to enjoy an evening with Marty Stuart and his band. A great way to end the event. But Sunday was another story...Sunday was "exit day"...sort of. You see, that "weather" I mentioned earlier, well, it kept raining on & off, more on that off, really. Most of us were parked on what started out to be dirt & grass...that quickly turned into mud and muck. I finally renamed our street (each row had a street name) from 5th street to Lake Lane! Pretty much everyone on our row had to be towed out. 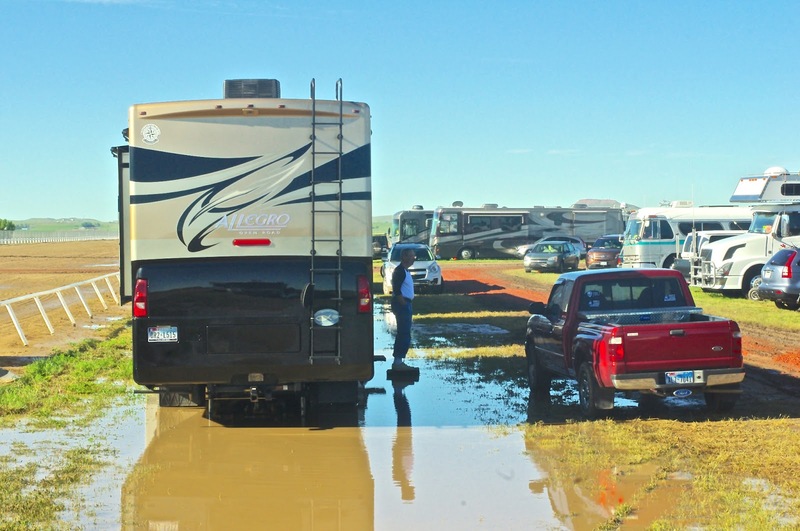 6" of mud & water just doesn't make for easy drive-ability when you have a 26,000 lbs vehicle! We had put wood under our tires, Jack thought that would help...nope, as soon as he drove off of them...we sank! 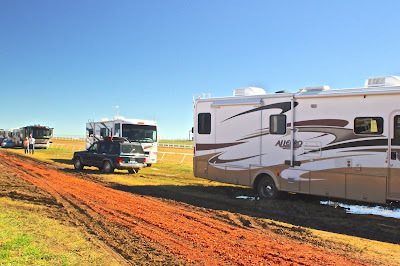 But, as RVer's do, one came to our rescue and tied his car to our RV and with a lot of tugging and willpower, he pulled us out! I couldn't hardly believe it (I delivered a nice bottle of red wine and a hug afterward)! A good washing getting all the mud splatters off, and the day was done...many, many things learned, enjoyed, and will be remembered for a long, long time, thank you FMCA! Might as well enjoy the lake view!